Sometimes being a baby is hard work. Sam has been sick for about two months now with reoccurring ear infections that never go away, so after five rounds of antibiotics it was decided she'd need tubes in her ears. 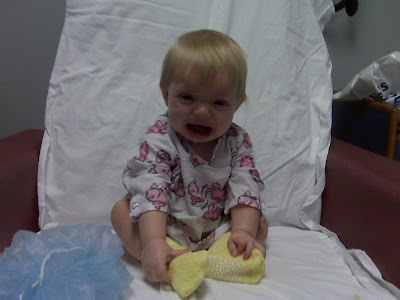 This morning Samantha had to be at the day surgery building at 7 a.m. for an 8 a.m. surgery time. No food or drink after 2 a.m. (we woke her up to feed her then) but she was all smiles when we got to the office. She was NOT a fan of the garb they made her wear. I think she was embarrassed that the gown opened in the back - my little modest child! 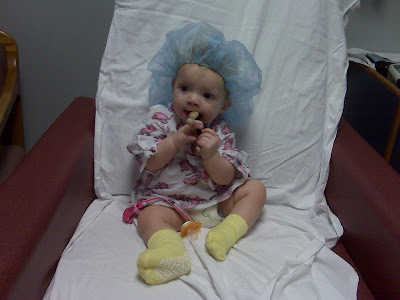 And notice the obviously necessary grippies on the bottom of her socks - I asked the nurse of she was going to learn to walk during surgery as well as get tubes. Once I gave her a toy, she cheered right up. We hung out in the pre-op waiting room for a few minutes, then a nurse came and asked to hold Sam. I handed her over and she said, "OK, we are going back. See you." What?!?!? I wasn't expecting that quick of a goodbye, but it was probably better that way - less chance for me to get upset. Sam of course went off smiling. For tubes, patients are knocked out for about 20 minutes, then they are taken to recovery. Sam was able to recover in an adjoining building instead of the regular recovery room - I guess old people just out of surgery get a little shaken up by screaming babies. After surgery Sam was upset and cried for about 30 minutes. Once she drank a bottle we headed home and she and Jay are napping away. Surgery is hard on all. She should be able to return to daycare tomorrow! We shall see!